Christine Dammann Photography | San Diego Family, Newborn, & Maternity Photographer— How to get your spouse on board for your family photography session | San Diego Family Photographer | Making Family Photos FUN! How to get your spouse on board for your family photography session | San Diego Family Photographer | Making Family Photos FUN! Last week I posted a blog with tips for getting your kids to cooperate for family photos. Whether you're having your family session at one of San Diego's beautiful beaches or in the comfort of your own home, I hope my tips help your family have an enjoyable experience together. I'm all about making family photos FUN! Today I am sharing tips for how to get the not-always-cooperative spouse on board with family photography. If you are fortunate to have a spouse who loves taking family photos and helps you plan what everyone will wear- awesome! My husband is not that person. Over the years I've learned a few things I can do to help him have more fun and give me less grief on the day of our session. 1. Communicate how much these photos will mean to you. Let your significant other know that documenting your family with professional photographs is important to you, and why. In my family I am the one taking all the photos. Scheduling a session once or twice a year with a professional means I get to actually be IN some of the photos. I don’t necessarily like being in front of the camera, but I do want to be visually represented in our family’s photographic memories. I want my kids to see me hugging them, laughing with them, and loving them. Sit down with your spouse and pull up your photographer’s website. Look through their portfolio so your spouse can see what sort of photos will be taken, and your photographer’s style. Talk about your favorites images and why you love them. Let your spouse know how long the session will last, and any other details that would help them prepare to be their best self on picture day. The first few times we had family photos taken I was stressed out! Between figuring out what we were all going to wear, prepping baby bags, getting myself ready, making sure we were on time, and worrying about the kids’ behavior during the session I was not fun to be around! How could I expect my husband to be relaxed and happy going into our session if I was a ticking time bomb myself? I have since learned to keep my cool, [click here for tips on that] my family will likely follow suit. 4. Book a lifestyle session. Booking a lifestyle session was a total game changer for my family. Lifestyle photography is about capturing your family living your life. It feels more relaxed and is more fun for everyone involved. We booked a lifestyle session at the beach. We started at an ice cream shop and then made our way to the beach to build sand castles, jump waves, surf, and have a fabulous time. We laughed together and no one stressed over perfect smiles behavior. The photos are my absolute favorite because we were being authentically us and having fun together. 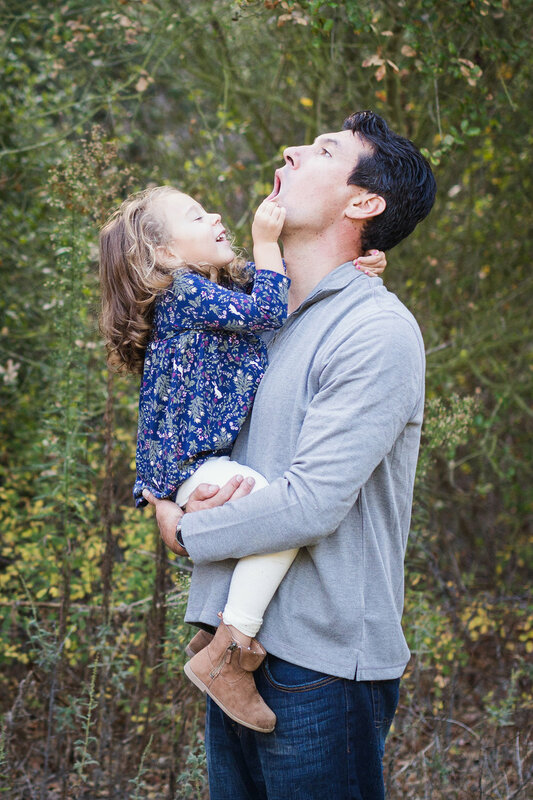 My husband just happened to text me while I was writing this blog post so I asked him what helps get him get on board with our family photos. He answered: “Beer”. There you have it folks! Rewards work for kids AND adults. A round of golf, a 6 pack of his favorite craft brew, a Sunday alone to OD on Football. Reward them ahead of time or afterwards, either way it will probably go over well and leave a better taste in their mouths for the next time you want family photos taken. Good luck friends! Leave a comment if you have more great ideas. I'd love to hear them!